Suta is a Mumbai-based design house whose Indian clothes look fresh as a daisy. They combine age-old weaving traditions that our artisans are familiar with, but give them a fun, creative spin. Think dramatic, but totally un-blingy. 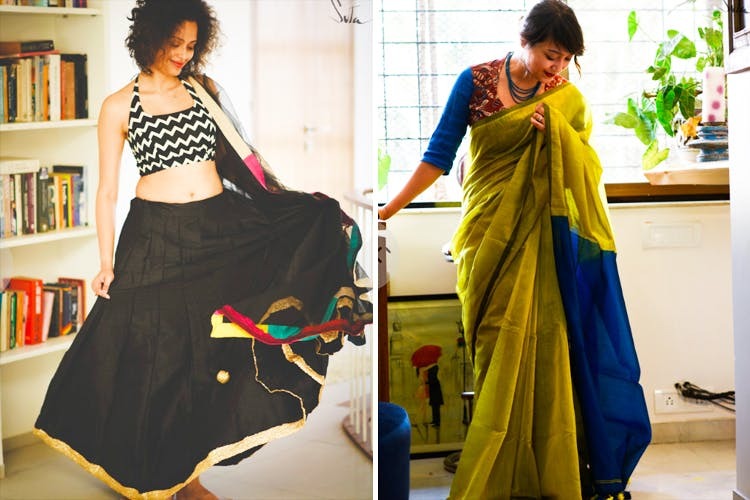 Founder Sujata and Taniya combined the syllables in their name (Su+Ta) and the result, Suta, also incidentally means ‘thread,’ which ties in perfectly with their idea of celebrating traditional weaves. Their saris are ideal for anyone who likes drapes that look fluffy as a cloud and yummy as marshmallow. While the double-coloured powder pinks and blues usually make us go weak in the knees, we are quite liking the Batik collection as well. For the slightly dressy occasions, Suta's cotton silk saris are perfect. The multi-coloured blouses are a worthy foil to these subtle-as-the-breeze saris, and we’re loving how they come together—the frills, halter necks and off-shoulders look striking against the conventional nine yards. Wouldn’t you agree? Bestie’s mehendi coming up? Suta’s lehngas will tide you over. Too clumsy to hold the sari? Check out their kurtas and dresses (calling all indie hipsters). We wish they had a physical store in Delhi. Getting the feel and look of a sari (on yourself) really does make a difference.